Navy won the toss and elected to receive in the first half. It took Notre Dame only 52 seconds to get points on the board. The Irish started on their own 21-yard line. After a one yard carry, Notre Dame's quarterback, Everett Golson found C.J. Prosise wide open for a 78-yard touchdown. On Navy's first possession, eight different players carried the ball. Navy ran the ball 10 consecutive plays before Keenan Reynolds found Thomas Wilson wide open in the end zone for a 26-yard touchdown completion. The catch was Wilson's second career catch and his first career touchdown. Navy's drive took 6:08 off the clock. Notre Dame started their next possession on the 35 yard line after Navy's kickoff went out of bounds. Three consecutive big plays moved the Irish down the field quickly. Golson found Corey Robinson for a 19-yard completion. Tarean Folston for an 11-yard carry. Folston got the next carry and rumbled 26 yards to the Navy four yard line. 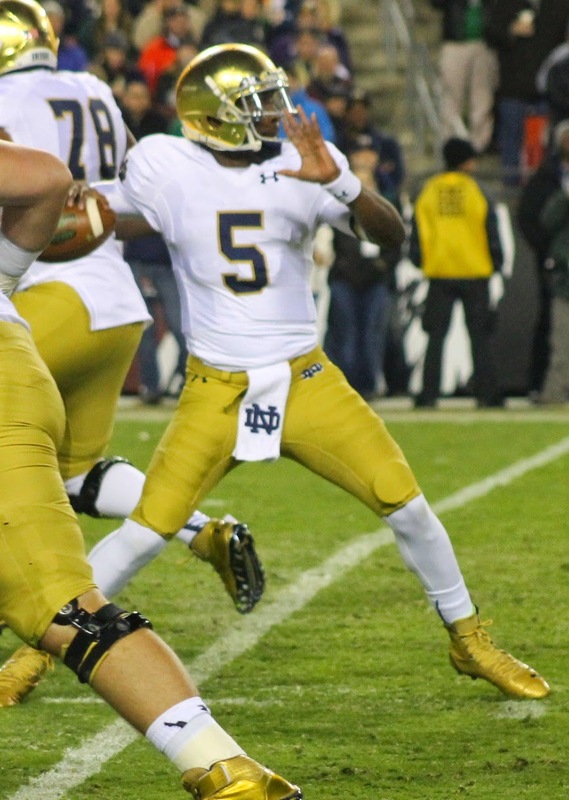 Three plays later, Golson found Ben Koyack in the end zone for a Notre Dame touchdown. This Irish scoring drive took slightly longer than their first, lasting 3:07. Navy was forced to punt on their ensuing drive after a 3-and-out. Pablo Beltran booted a 51-yard punt to the Notre Dame 24. The Irish are driving and the quarter ended with Notre Dame first and goal on the Navy 5. Notre Dame ended the quarter with a 215-75 offensive yardage advantage.